The information on this page has been gathered from a variety of sources and is reproduced here for the convenience of Alexander Technique teachers who desire a bit more knowledge about special spine conditions they might encounter in their teaching practice. This is purely for educational purposes and should not in any way be seen as medical advice. The Alexander Technique can help those living with special spines to understand and improve their movement patterns but it cannot have any impact on the underlying condition itself. Scoliosis (from Ancient Greek:σκολίωσις skoliosis "bending") is a medical condition in which a person's spinal axis has a three-dimensional deviation. 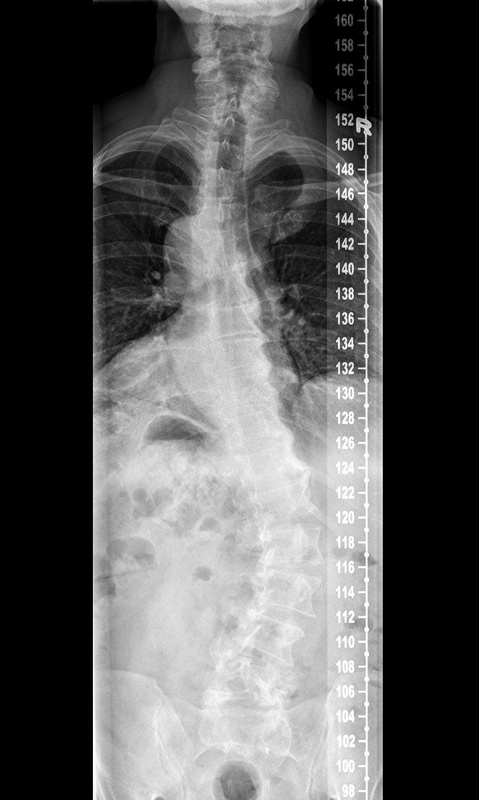 Although it is a complex three-dimensional condition, on an X-ray, viewed from the rear, the spine of an individual with scoliosis can resemble an "S" or a "C", rather than a straight line. Scoliosis is typically classified as either congenital (caused by vertebral anomalies present at birth), idiopathic (cause unknown, sub-classified as infantile, juvenile, adolescent, or adult, according to when onset occurred), or secondary to a primary condition. In 2015 a Japanese research team discovered a gene that is linked to susceptibility to the condition. Recent longitudinal studies reveal that the most common form of the condition, late-onset idiopathic scoliosis, causes little physical impairment other than back pain and cosmetic concerns, even when untreated, with mortality rates similar to the general population. Older beliefs that untreated idiopathic scoliosis necessarily progresses into severe (cardiopulmonary) disability by old age have been refuted by later studies. The rarer forms of scoliosis pose risks of complications such as heart and lung problems. Scoliosis is a life-long condition; management of the condition includes treatments such as bracing, physical therapy and surgery. Having scoliosis, even a severe case, does not necessarily mean a person cannot accomplish remarkable feats of physical performance. Dana Caspersen, the ballerina featured in this video, has two 50 degree curves in her spine, and yet managed to have an extraordinarily successful career in Ballet Frankfurt and the Forsythe Company. She also took regular lessons in the Alexander Technique during most of that time. Dana has also written an open letter to scoliosis patients in which she tells her story of using Alexander Technique to gain better control her back pain. Noncongenital muscular torticollis may result from scarring or disease of cervical vertebrae, adenitis, tonsillitis, rheumatism, enlarged cervical glands, retropharyngeal abscess, or cerebellar tumors. It may be spasmodic or permanent. A more obscure trigger for muscular torticollis can be excessive weight, either carried around the shoulders or neck (as in a yoke or heavy bag). 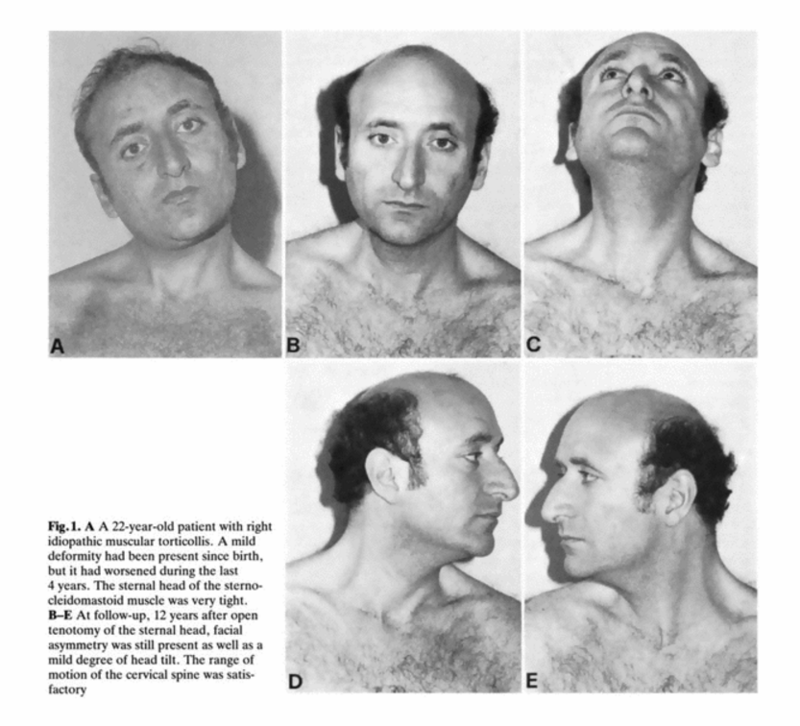 A self-limiting spontaneously occurring form of torticollis with one or more painful neck muscles is by far the most common ('stiff neck' or 'wry neck') and will pass spontaneously in 1–4 weeks. Usually the sternocleidomastoid muscle or the trapezius muscle is involved. Sometimes draughts, colds, or unusual postures are implicated; however in many cases no clear cause is found. These episodes are commonly seen by physicians. Tumors of the skull base can compress the nerve supply to the neck and cause torticollis, and these problems must be treated surgically. Infections in the posterior pharynx can irritate the nerves supplying the neck muscles and cause torticollis, and these infections may be treated with antibiotics if they are not too severe, but could require surgical removal. Grisel's syndrome, a subluxation of the upper cervical joints, mostly the atlantoaxial joint, due to inflammatory laxity of the ligaments caused by an infection. This bridge must either be broken through manipulation of the neck, or, surgically resected. The use of certain drugs, such as antipsychotics, can cause torticollis. There are many other rare causes of torticollis. Congenital muscular torticollis (CMT) is a rare, painless congenital musculoskeletal disorder characterized by unilateral shortening of the sternocleidomastoid muscle (SCM). It presents in newborn infants or young children with reported incidence ranging from 0.3% to 2%. 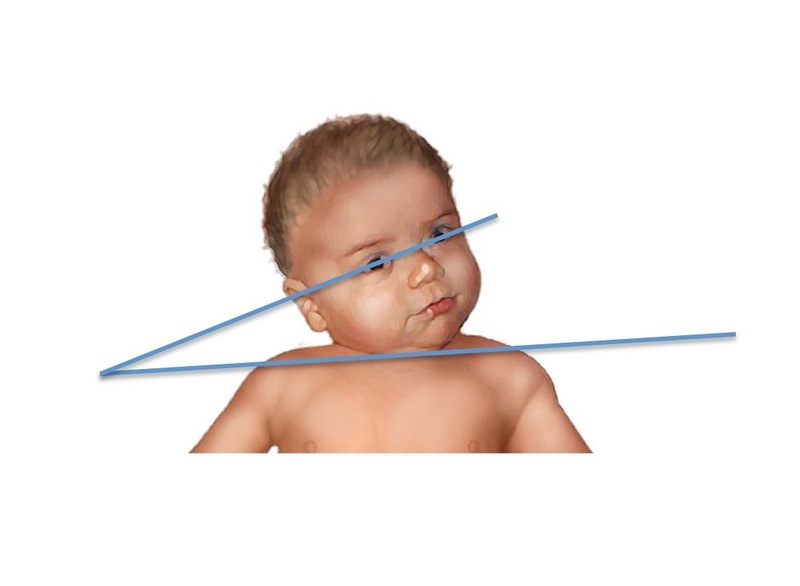 Owing to effective shortening of SCM on the involved side there is ipsilateral (same side) head tilt and contralateral (opposite side) rotation of the face and chin. Numerous theories have been proposed, but the true causes of CMT remains uncertain. Various causes implicated for CMT includes intrauterine crowding or vascular phenomenon, fibrosis from peripartum bleeds, compartment syndrome, primary myopathy of the SCM and traumatic delivery. Spasmodic torticollis is an extremely painful chronic neurological movement disorder causing the neck to involuntarily turn to the left, right, upwards, and/or downwards. The shoulders may also be uneven and some patients experience tremors in the head or arms.mpanied by constant and extreme pain. Both agonist and antagonist muscles contract simultaneously during dystonic movement. Approximately 0.003% – so about 5,000 people in the Netherlands – are known to suffer from ST. Causes of the disorder are predominantly idiopathic (unknown). A small number of patients develop the disorder as a result of another disorder or disease. Most patients first experience symptoms midlife. Because it can be more severe during times of anxiety or stress, ST was once thought to be a psychiatric disorder. Research has shown, however, that while ST does indeed seem to originate in the brain, it is clearly a neurological disorder rather than a psychiatric one. The most common treatment for spasmodic torticollis is the use of botulinum toxin type A (botox). ST can resemble other disorders including Parkinson’s disease, epilepsy, muscular dystrophy and wry neck. 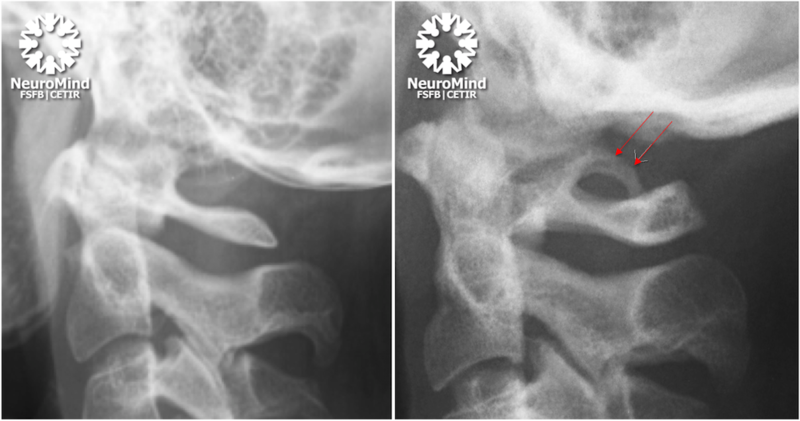 Spondylosis (from Ancient Greek σφόνδυλος spóndylos, "a vertebra") is degenerative osteoarthritis of the joints between the center of the spinal vertebrae or neural foramina. If this condition occurs in the facet joints, it can be considered facet syndrome. If severe, it may cause pressure on nerve roots with subsequent sensory or motor disturbances, such as pain, paresthesia, and muscle weakness in the limbs. When the space between two adjacent vertebrae narrows, compression of a nerve root emerging from the spinal cord may result in radiculopathy (sensory and motor disturbances, such as severe pain in the neck, shoulder, arm, back, or leg, accompanied by muscle weakness). Less commonly, direct pressure on the spinal cord (typically in the cervical spine) may result in myelopathy (neurologic deficit related to the spinal chord), characterized by global weakness, gait dysfunction, loss of balance, and loss of bowel or bladder control. The patient may experience shocks (paresthesia) in hands and legs because of nerve compression and lack of blood flow. 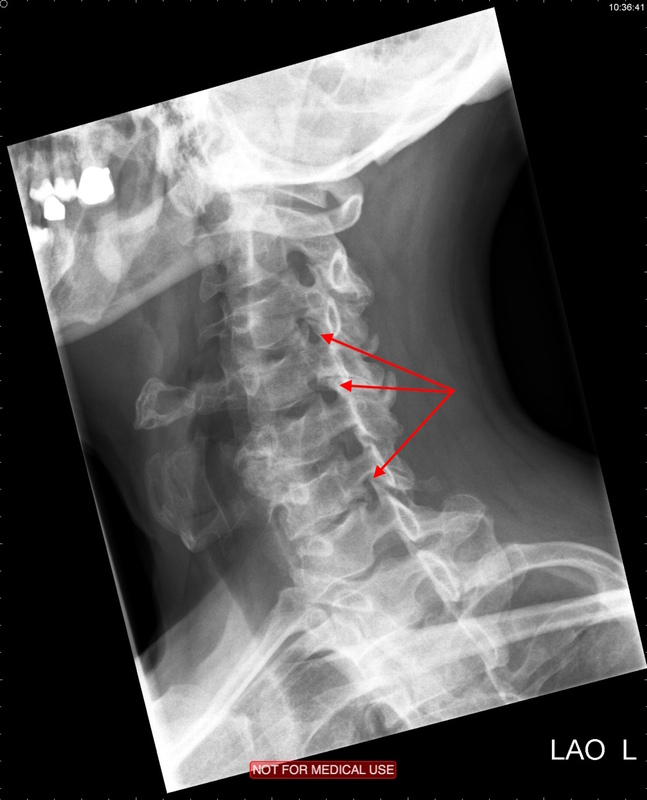 If vertebrae of the neck are involved it is labelled cervical spondylosis. Lower back spondylosis is labeled lumbar spondylosis. Spondylolysis is defined as a defect in the pars interarticularis of the vertebral arch. The great majority of cases occur in the lowest of the lumbar vertebrae (L5), but spondylolysis may also occur in the other lumbar vertebrae, as well as in the thoracic vertebrae. Isthmic spondylolisthesis is the most common form; also called spondylolytic spondylolisthesis, it occurs with a reported prevalence of 5–7 percent in the US population. A slip or fracture of the intravertebral joint is usually acquired between the ages of 6 and 16 years, but remains unnoticed until adulthood. Roughly 90 percent of these isthmic slips are low-grade (less than 50 percent slip) and 10 percent are high-grade (greater than 50 percent slip). Degenerative spondylolisthesis is a disease of the older adult that develops as a result of facet arthritis and joint remodeling. Joint arthritis, and ligamentum flavum weakness, may result in slippage of a vertebra. Degenerative forms are more likely to occur in women, persons older than fifty, and those of African descent. Traumatic spondylolisthesis is rare and results from acute fractures in the neural arch, other than the pars. Pathologic spondylolisthesis has been associated with damage to the posterior elements from metastases or metabolic bone disease. 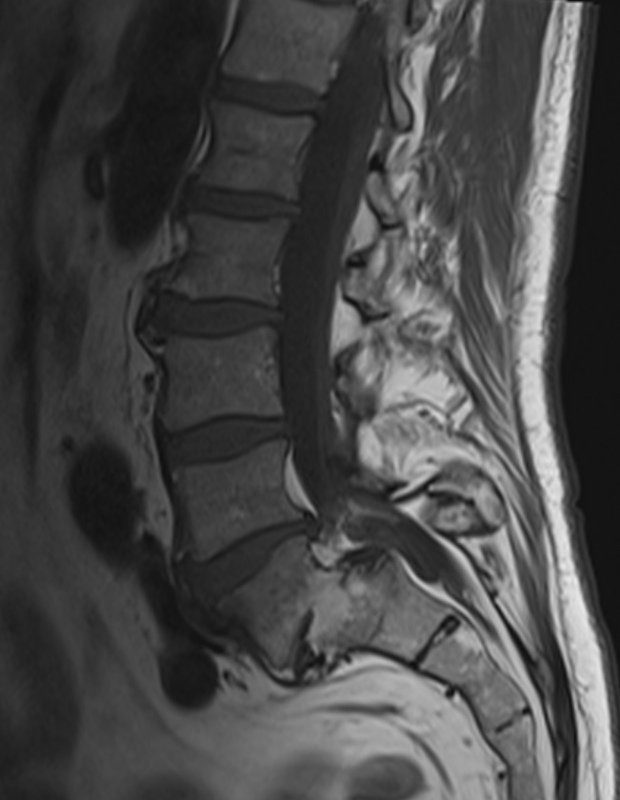 Dysplastic spondylolisthesis is a rare congenital spondylolisthesis occurring because of amalformation of the lumbosacral junction, resulting in small, incompetent facet joints. Spondylolisthesis is the forward displacement of a vertebra, especially the fifth lumbar vertebra, most commonly occurring after a fracture. (Backward displacement is referred to as retrolisthesis.) The degree of slippage determines the Grade of spondylolisthesis: 0-25% Grade 1, 25-50% Grade 2, 50-75% Grade 3, 75%+ Grade 4. Kimmerle anomaly, also known as arcuate foramen, also known as ponticulus posticus (Latin for "little posterior bridge"), refers to a bony bridge on the atlas (C1 vertebra) that covers the groove for the vertebral artery. It is a common anatomical variation and estimated to occur in approximately 16% of the population. It seems to occur in females more commonly than males. The ponticulus posticus is created through ossification of the posterior atlantooccipital ligament. It has been associated to migraine, shoulder and arm pain, neck pain, headaches and dizziness. 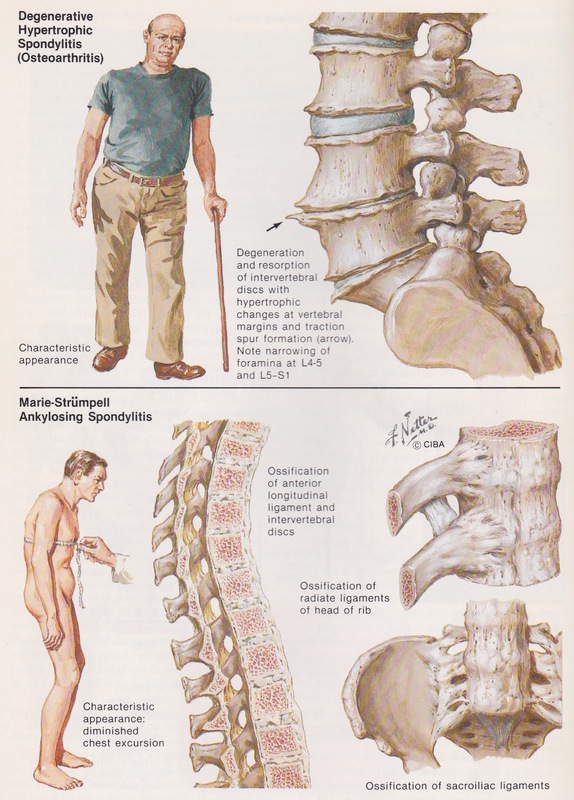 Spondylitis is inflammation of one or more of the vertebrae, and takes several forms. The most widely occurring are hypertrophic, ankylosing and tuberculous spondylitis (Pott's disease). The latter has become very rare in developed countries due to widespread availability of effective antibiotics for the tuberculosis bacillus. Hypertrophic spondylitis, also known as osteoarthritis (Dutch: "artrose") of the spine, is a degenerative disease seen mostly in those over the age of 50. 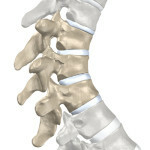 It is characterized by the destruction of intervertebral disks and the growth of bone spurs on the vertebrae themselves. Treatment includes the application of heat, anti-inflammatory painkillers (NSAIDs, like ibuprofen and aspirin), and exercises to maintain normal range of movement. Ankylosing spondylitis (AS, from Greek ankylos, crooked;spondylos, vertebra; -itis, inflammation), previously known as Bekhterev's disease and Marie-Strümpell disease, is a chronic inflammatory disease of the axial skeleton, with variable involvement of peripheral joints and nonarticular structures. AS is one of the seronegative spondyloarthropathies and has a strong genetic predisposition. It mainly affects joints in the spine and the sacroiliac joint in the pelvis. In severe cases, complete fusion and rigidity of the spine can occur. Importantly however it is a systemic rheumatic disease, meaning it affects the entire body. "Bamboo spine" develops when the outer fibers of the fibrous ring of the intervertebral discs ossify, which results in the formation of syndesmophytes (bony growths inside ligaments, similar to osteophytes or bone spurs) between adjoining vertebrae. Ankylosing spondylitis prevalence is between 0.1 and 0.2% of the general population. The disease is most prevalent in Northern European countries, and seen least in people of Afro-Caribbean descent. The ratio of male to female disease is 3:1, however many rheumatologists believe the number of women with AS is underdiagnosed, as most women tend to experience milder cases of the disease. Prognosis is related to disease severity. AS can range from mild to progressively debilitating and from medically controlled to refractory. Some cases may have times of active inflammation followed by times of remission resulting in minimal disability, while others never have times of remission and have acute inflammation and pain, leading to significant disability. As the disease progresses, it can cause the vertebrae and the lumbosacral joint to ossify, resulting in the fusion of the spine. This places the spine in a vulnerable state because it becomes one bone, which causes it to lose its range of motion as well as putting it at risk for spinal fractures. This not only limits mobility but reduces the affected person's quality of life. Complete fusion of the spine can lead to a reduced range of motion and increased pain, as well as total joint destruction which could lead to a joint replacement. Over a long-term period, osteopenia or osteoporosis of the AP spine may occur, causing eventual compression fractures and a back "hump". Paresthesia is a complication due to the inflammation of the tissue surrounding nerves. Organs commonly affected by AS, other than the axial spine and other joints, are the heart, lungs, eyes, colon, and kidneys. Other complications are aortic regurgitation, Achilles tendinitis, AV node block and amyloidosis. Owing to lung fibrosis, chest X-rays may show fibrosis, while pulmonary function testing may reveal a restrictive lung defect. Scheuermann's disease is also known as Scheuermann's kyphosis, Calvé disease, and idiopathic juvenile kyphosis. It describes a condition where the vertebrae grow unevenly with respect to the sagittal plane (the plane which divides the body into right and left halves); that is, the posterior angle is often greater than the anterior. This uneven growth results in the signature "wedging" shape of the vertebrae, causing kyphosis. 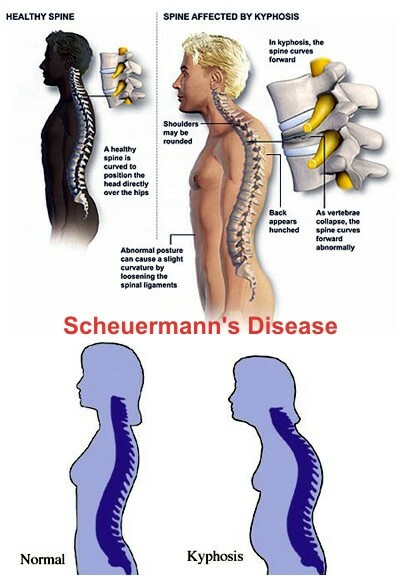 Scheuermann’s disease is most frequently diagnosed between ages 13 and 17 years. The overall incidence is 0.4% to 10%. The typical patient is between the late juvenile to age 16 years, commonly between 12 and 15 years. There is no specific gender prevalence. Scheuermann’s disease is considered hereditary, although the hereditary pattern has not been clearly defined. Patients suffering with Scheuermann’s kyphosis cannot consciously correct their posture. The apex of their curve, located in the thoracic vertebrae, is quite rigid. Treatment for Scheuermann's disease is symptomatic and include mild pain medicine, avoiding activities that worsen the pain, and bracing if necessary. This disease does not typically cause symptoms into adulthood and does not usually require surgical treatment. Young teens with Scheuermann disease tend to do well, even if they need surgery. The disease stops once they stop growing.